Paramount has released the first official teaser poster for director J.J. Abrams’ reboot sequel Star Trek Into Darkness. Chris Pine, Zachary Quinto, Karl Urban, Zoe Saldana and Benedict Cumberbatch star in the highly anticipated sci-fi action thriller. 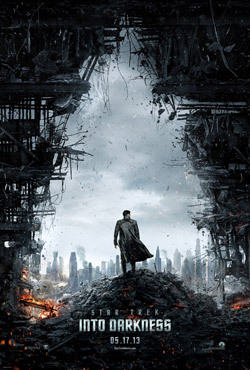 Star Trek Into Darkness will be presented in 3D, 2D, and IMAX and is slated for release on May 17, 2013. Click on the poster below for a larger version.